Heading Handcrafted in Boston, England for over 100 years. 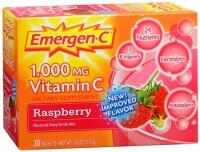 Directions Adults and children 3 years and over: Allow 1 lozenge to dissolve slowly in the mouth. Repeat every hour as needed, or as directed by a doctor. Children under 3 years: Ask a doctor. 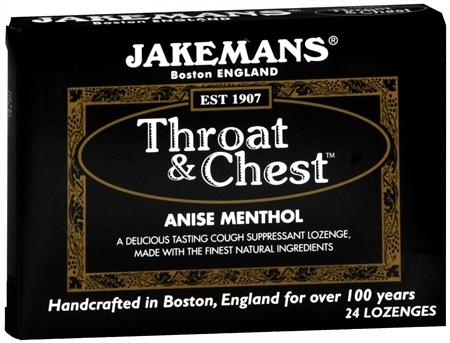 Uses Temporarily relieves: cough due to minor throat and bronchial irritation occurring with the common cold or inhaled irritants; occasional minor irritation or sore throat. 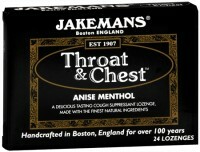 Jakesmans famous and original Throat & Chest Lozenges are made with the finest natural ingredients, carefully blended with soothing menthol to obtain a unique mouth watering and refreshing taste. 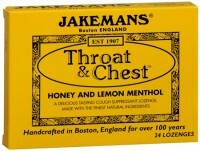 Once tasted they will be your favourite soothing lozenge! 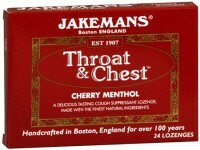 Warnings Sore throat warning: If sore throat is severe, persists for more than 2 days, is accompanied or followed by fever, headache, rash, swelling, nausea or vomiting, consult a doctor promptly. These may be serious. Ask a doctor before use if you have: persistent or chronic cough as occurs with smoking, asthma or emphysema; cough that occurs with excessive phlegm (mucus). Stop use and ask a doctor if: cough persists for more than 1 week, tends to recur, or is accompanied by fever, rash or persistent headache. 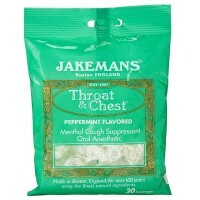 These could be signs of a serious condition; sore mouth symptoms do not improve in 7 days. If pregnant or breast-feeding, ask a health professional before use. Keep this and all drugs out of the reach of children.